And that's it! 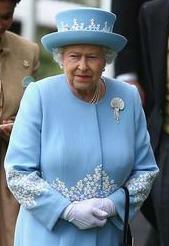 Ascot is over, and the Queen's going out in her Wedgwood best, complete with diamonds and pearls. I'm quite pleased with the Ascot brooch show this year, aren't you? Something old, something new (and something kinda new), something borrowed (from the Queen Mother's look, that is), and something blue.